This book identifies the main factors by which the Nazi movement rose to power and measures their relative importance. It discusses Hitler's leadership, the strategy of party tacticians, and the favorable circumstances of popular economic and social discontent. Based on more than 600 autobiographies obtained from followers of Hitler, The Nazi Movement explains the social bases of Nazism and why it was so appealing. Theodore Abel argues that no movement can succeed unless its adherents are motivated by deep, persistent, and widespread discontent with a societal status quo. A movement must also set forth an inspiring goal based upon deeply rooted popular sentiments. Finally, a successful movement must have a charismatic leader with organized, dedicated followers. Abel's analysis of the Depression, inflation, and right- and left-wing rioting and activities, gives theoretical depth to his earlier study of Nazi Party member's political biographies. Originally published in 1938,The Nazi Movement remains at the heart of current debates on fascism and other nationalist/authoritarian movements. 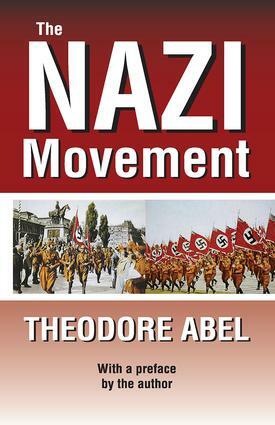 This book is a significant theoretical elaboration of Abel's earlier work, in which he interviewed ordinary Germans and discussed Nazism with them. Abel's work helps us understand why and how Hitler and his Nationalist Socialist party took root among ordinary middle and working class German people. In so doing, he takes us beyond those who focused on ideological dogmas that presented Nazism as a ruling class movement at one end and a vehicle for proletarian disaffection at the other.